The Milstein family, under the leadership of Mr. Howard P. Milstein, has achieved prominence in business and philanthropy for three generations. A leading figure in local, national and global affairs, Mr. Milstein is a trusted advisor on economic, civic and philanthropic matters. His ability to marshal business, government, philanthropic, and family resources drives a breadth of initiatives across medicine and health, civic, educational and security matters. A deep respect for family heritage has played an important role in Mr. Milstein’s careers in business and philanthropy. The Milstein family devotes remarkable attention, wisdom and resources to the numerous organizations that it operates and supports. The Milstein family enterprises operate in many areas that present the most challenging issues in the world today. “If you want to be effective in the charitable sector, train yourself in the private sector.” Mr. Milstein once said. The Milstein family businesses and philanthropies began with Morris Milstein, a Russian Jewish immigrant who founded a flooring business in the US. In 1919, Morris established Circle Floor Company, Inc. After WWII, the company’s operations expanded to all over the United States. By 1960, Circle Floor was dominating the New York market, installing floors, walls and ceilings for many of the city’s landmarks, including Rockefeller Center, the United Nations campus, LaGuardia and Kennedy airports and Lincoln Center. Morris’ son, Paul, conceived the idea of a real estate development company in the 1950’s. Thus Milstein Properties was born, along with the story of a great real estate family enterprise. The Milstein family has built or bought more than 50,000 apartments, 8,000 hotel rooms and 20,000,000 square feet of office space in the US through family-controlled entities. In 1974, the Milstein family entered the mining and energy sectors. During the same year, the family acquired United Brands. United Brands – the parent company of Chiquita Bananas – was the largest employer in seven Latin American countries. During the 1986 US banking crisis, the Milsteins acquired Emigrant Bank, a 150-year-old establishment that had aimed to help immigrants like Morris Milstein. The bank’s early customers were mostly Irish immigrants; now many of the bank’s customers are Chinese. Mr. Milstein brought his vision and expanded the scope of his family business, incorporating venture capital, computer technology and telecommunications into his family’s holdings. In 1986, Mr. Milstein established Liberty Cable Co. and shortly led it to become a strong competitor in the US cable market. In 1996, the company was sold after successfully breaking the monopoly held by Time Warner. During the same period, Emigrant Bank’s operations expanded to include Internet banking, wealth management, fine art finance and life technology finance. Under the leadership of Mr. Milstein, Emigrant Bank became the largest privately held bank in the US. In 1989, the Milsteins purchased Douglas Elliman-Gibbons & Ives, a white glove real estate management and brokerage firm whose star had long been waning. The Milsteins restored its position as the pre-eminent residential real estate and management firm in New York City. During Howard’s ten-year tenure as Chairman, Douglas Elliman became a vertically integrated, full-service operation, cross-selling housing-related services from insurance to interior design. In 1999, Douglas Elliman was successfully sold to the largest real estate firm in the U.S.
Paul Milstein first became involved with China in 1983. The Milstein’s operations in China naturally stemmed from the family’s business efforts in the country, including golf course constructions along with partner Jack Nicklaus. 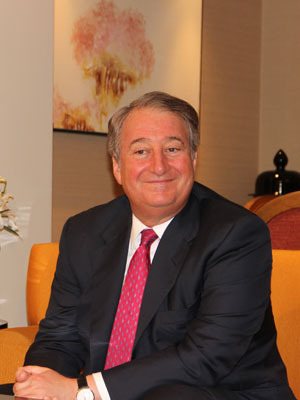 The Milstein family brought to China their expertise in asset management and large-scale real estate development. Their most notable contribution to China, as reflected in the family’s long tradition of philanthropy, would be the establishment of the Milstein Medical Asian American Foundation. Under the leadership of Mr. Milstein, the Milstein family established the Milstein Medical Asian American Partnership Foundation (MMAAPF). As an international collaborative organization, the foundation aims to improve world health by developing mutually beneficial partnerships between the United States and China, as well as greater Asia. Working with some of the premier health organizations in the world, the MMAAP Foundation will bring together and fund exchanges among the best research, medical talent, and institutions in the regions. The MMAAP Foundation will focus on areas that include: Senior Healthcare, Skin Disease and Melanoma, Reproductive Biology, Blood Research, and Translational Medicine. The formation of MMAAPF stems from Mr. Milstein’s exceptional leadership in health care. He chairs the New York Blood Center, one of the largest blood centers globally and serving 200 hospitals and over 20 million people. He also founded the Milstein National Cord Blood Center, the largest cord blood bank in the world serving patients in 34 countries. In 2011, the FDA approved the first HPC-C cell therapy, HEMACORD, which was developed by the New York Blood Center. Mr. Milstein is also Chairman of the American Skin Association, an organization that aims to find cures for melanoma and other skin diseases. In 2007, the Milstein family established the Milstein Medical Research Program at the Rockefeller University. The family also supports research efforts to find cures for diseases such as TB at the Weill Cornell Medical College. Additionally, Mr. Milstein also chairs the Jones Foundation for Reproductive Medicine. The foundation supports research and educates the public to advance reproductive medicine and bioethics, aiming to further infertility research and promote reproductive health. In the 1970s, the Milstein family supported the pioneering interferon research of Dr. Samuel Graff. Mr. Milstein said the establishment of MMAAPF trails the historical accomplishments in health care and medical research. He adds that the US has long been involved in medical philanthropic efforts in Asia, with the founding of the Peking Union Medical College and the China Medical Board by the Rockefellers in 1915. Mr. Milstein adds that his family is proud to be able to be part of such remarkable heritage.